When we originally began the planning process of buying a school bus we knew we would have to do quite a lot of demolition. 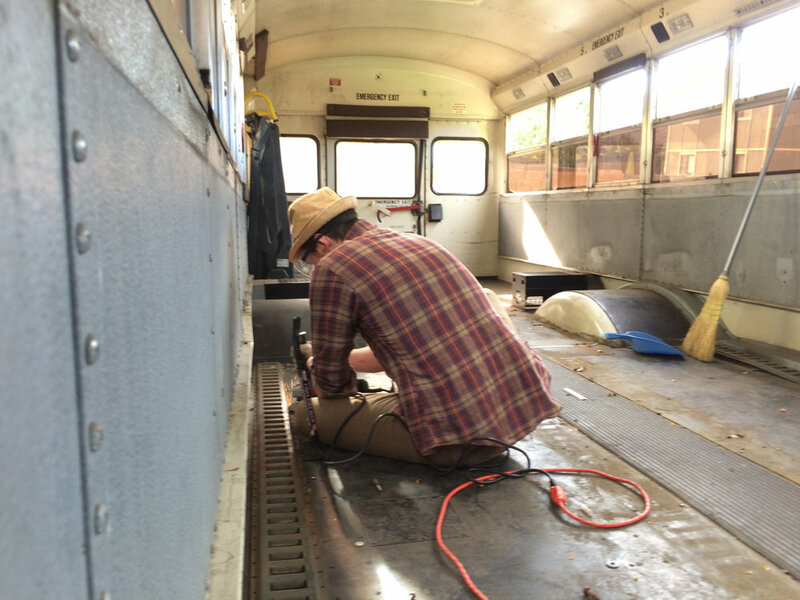 Removing seats, tearing out the floors, ripping out screws, etc. We also knew we’d have to learn how to use some power tools that neither of us had any experience with previously. Fortunately we did a lot of research prior to taking the plunge. We knew the seats were most likely bolted through the bus and that one of us would probably have to be underneath to hold a nut while the other ratcheted the bolt from the top. This worked for about 10 minutes. Due to mechanical features underneath the bus the person underneath keeping the nut stationary had to contort themselves into sometimes painful positions. A few short minutes and a crippling neck cramp later we went out and bought an angle grinder to cut off the bolt heads so that the seats could be lifted out freely. After two or three return trips to Lowe’s to get the proper cutting wheel we were ready to get down to business. (We used a type 27 cutting wheel because our grinder came with a type 27 guard. The “type” is a reference to the style of wheel being either completely flat ((type 1)) or being lowered in the center ((type 27))). I was tasked with cutting the bolt heads and, having never used an angle grinder before and being understandably intimidated by a sharp wheel spinning at 12,000 RPM, I was a bit slow to make any real progress. Finally after watching a few videos of people being rather ham fisted with this terrifying tool I mustered up the gumption to put my back into it and short story long I now know how to use an angle grinder. And its actually not that bad. Ours was $30 with a $3 or so wheel (we went through a couple wheels). Now the seats are out. I was honestly dreading this task, but the angle grinder certainly made things easier. Next up is the floor. Hopefully there isn’t too much rust underneath the (what is most certainly rotten) plywood.